Yesterday David and I went for a walk on the hills above our home and it occurred to me that this view of the Black Mountains illustrates perfectly aerial perspective, or recession. 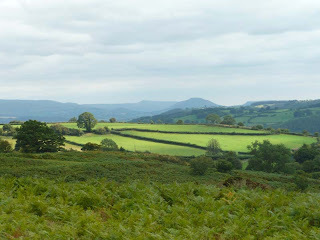 Notice how the distant mountains are blue, the middle distance hill is blue/green, the bright green fields are cool green with touches of blue/green shadow and the foreground bracken is warm yellow/green. In reality all these greens are similar in colour temperature but the atmosphere between gives this effect and it is the key to creating the illusion of a three dimensional space on a two dimensional painting surface. This autumn David and I are demonstrating this and many other aspects of painting the landscape in two Seminars. David will be demonstrating in watercolour in Great Bookham, Surrey. Details are on the website. Also you can see detail of our painting courses for 2012 in Yorkshire, Mid Wales, Somerset and Pembrokeshire. You can also download a copy of our annual newsletter and order form. We are also taking part in a joint exhibition at Aberglasney Gardens this month. Entry to the preview and the gardens is free from 6.30 to 9.00 p.m. on 9th September. This entry was posted in aerial recession in landscape paintings, art, atmosphere, Jenny Keal Blog, jenny keal pastel., pastel, pastel painting by Jenny Keal. Bookmark the permalink.